Like most postsecondary institutions, the University of Alberta (UAlberta), Edmonton, Canada, must address maintenance issues with budgets that have not kept pace with the needs of facilities. Newer, more advanced technical facilities place higher demands on maintenance. At UAlberta, for example, the average cost for a work order at a newer building is $801, compared to $551 at an older, less complex facility. The age of our facilities plays a large role in how we address operational maintenance. With recent expansion, approximately 21 percent of the university’s 1.2 million gross square meters is under 21 years of age. Still, most of the 440 facilities on campus are more than 25 years old, with some significant buildings dating to the early 1900s. The vast majority (88.5 percent) of our deferred maintenance is found in buildings more than 40 years old. Our philosophy of keeping new buildings in good condition has mitigated the model of aging facilities, automatically increasing deferred maintenance. We utilize a software tracking tool to record deferred maintenance values and conduct facility condition audits on a five-year rotation. Strategic and tactical planning for dealing with deferred maintenance are based on the projects that must be undertaken within the next five years to reduce the facility condition index (FCI) to zero for new buildings. Due to limitations—on funding, construction time, and temporary space—we aim for an FCI between 15 and 20 for older facilities. As shown below, more than half of deferred maintenance projects are in science facilities and labs. The funding model for postsecondary institutions in the province of Alberta provides “lights on” operational funding to cover utilities, operations and maintenance, and all general facility costs (excluding program and IT costs). The province provides additional funding through an annual infrastructure maintenance program (IMP) grant, earmarked specifically for deferred maintenance. The current formula for awarding IMP grants factors in student load and area on a percentage basis. For FY15, the province set IMP funding for UAlberta at $17 million—representing 2.35 percent of the measured deferred maintenance value. Given this significant funding gap, how can the institution make progress against the deferred maintenance backlog, while maintaining a 443-acre campus and keeping everything operational for our nearly 39,000 students? Part of the answer lies in identifying funding partners—faculties, who can leverage donor funds; and internal groups, such as IT. We began this approach in 2001, inviting departments to formally apply for partner funds on renewal projects up to $500,000 in value. Over time, the process has evolved to an open dialogue with faculties; together we look at larger-scale projects that may be carried out over several years. This approach has enabled us to fully modernize floors and smaller buildings, not just labs and offices. With such partnerships, the IMP covers the costs associated with base building system deferred maintenance, hazardous material abatement, and any required building code upgrades. Faculties contribute to the interior finishing and program needs. Typically, the project costs are shared 50/50. For example, a partner project underway for 2016—which will significantly reduce deferred maintenance—includes renewal and modernization of a wet lab research floor in a science building; the faculty contribution is $2 million, matched by $2 million in IMP funding. In addition, UAlberta is unique to its provincial counterparts in having a rolling, self-funded energy management program. Utility savings from energy initiatives, such as window replacements or mechanical systems upgrades, flow back into the energy program. Combining deferred maintenance renewal with energy initiatives allows for the program to recognize a portion of project costs related to new, more efficient systems. Renewing the building envelope for one academic building, for instance, recently carried a $2 million cost; the energy management program contributed $400,000 of it. On occasion, we also have access to specialized funds available from government agencies. While these funds are modest, each additional dollar is targeted to a deferred maintenance issue, such as replacing an aged, under-capacity air system in a specialized research space. We maintain a file of case studies, position papers, and letters of support from researchers so that we can quickly raise awareness of campus needs whenever such funds become available. 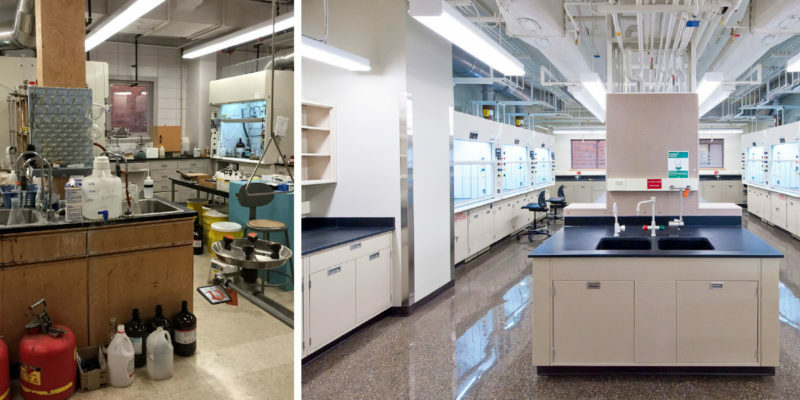 Before and after: This University of Alberta chemistry facility, originally constructed in 1960, was selected for full renewal over a number of years. Keep new buildings new. We concentrate maintenance activities on extending the life cycle of systems in new and renewed facilities. Identify facilities that cannot be repurposed or are in such poor condition (FCI greater than 70) that we will allow them to age out. For these assets, we undertake maintenance and required repairs only. Assume renewal of any component or system must last 10 to 15 years. We cannot use IMP grants, only operational budgets, to fund temporary repairs. Work orders for repair have decreased since we have moved to a philosophy of renewal. Select buildings for full renewal by using the asset inventory and working with space planning. Bundle project components, where appropriate, to increase efficiencies and maximize cost effectiveness. We wouldn’t replace stained ceiling tiles without changing the leaking control valve above and; if doing the ceiling, we’d also consider the floor and walls for renewal. Doing all the components means that we don’t have to return to that space for 10 years. Leverage programs across campus. Over three years, for instance, a partnership with IT enabled us to upgrade more than 100 classrooms with blackboards and whiteboards and to develop smart classrooms equipped with projectors, podiums, and wiring for student devices. Work with faculties on a strategic approach to renewing facilities over time. While it’s asking a lot of faculty to manage their program within a building that is undergoing some form of construction for an extended period, having the building fully renewed at the end of five to seven years is a significant achievement. Continue lobbying funding partners for support. Thank them for what they have provided, celebrate the renewals jointly through press releases and facility tours, and quietly ask for additional funds. Always have a list of small, shovel-ready projects ready to present to government, in case additional funding becomes available. Pay attention to what funding partners are saying and modify the program accordingly. A few years ago, life safety was the major issue, with fire alarm and fume hood exhaust fan renewals. The direction then changed to projects supporting commercialization and research. Now we evaluate projects on the basis of climate change goals, such as reducing greenhouse gases. In 2001, an audit set the baseline campus FCI at 37.26 percent. After changing our approach to deferred maintenance, the FCI dropped to 35.42 percent in 2006 and to 30.02 percent in 2012. After a cut in IMP funding in FY14, the campus FCI started to increase slightly—but soon it should start another downward trend due to recently announced partnership funding for facility renewal.